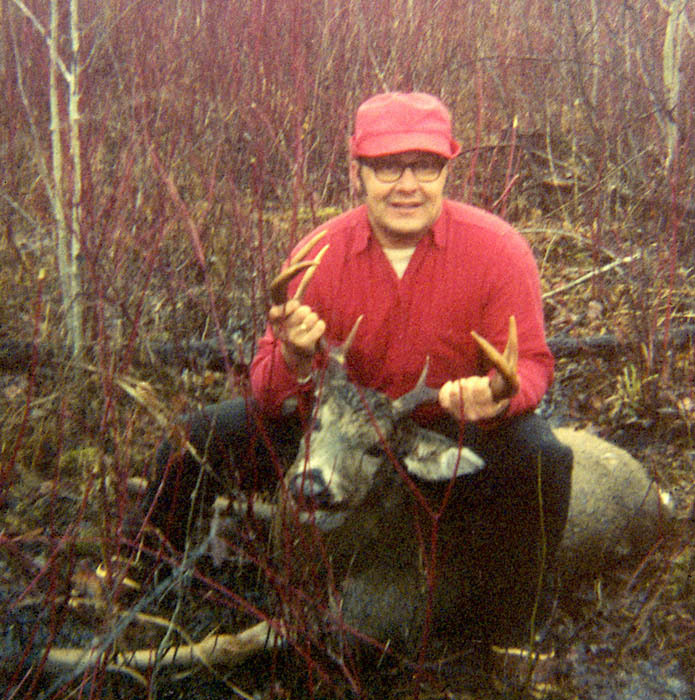 An early photo of Doc with a big buck. He took this buck in a doe feeding area — note the abundance of red osier. Upon my desk lies a letter that includes two questions I am asked more than one-hundred times a year: “Which brand of doe-in-estrus pheromone (doe urine) do you find to be most effective?” and “Which make and model of buck grunt call do you find to be most realistic and effective?” Such questions reflect the sad state of whitetail hunting today. A great many whitetail hunters (perhaps a majority) believe successful whitetail hunting, like successful fishing, is a matter of using the right lure; a matter of attracting a quarry (especially a buck) to a site (generally a spot with a good view) chosen by the hunter. Ten to fifteen years ago, some lures, if properly used, actually did improve hunting success, but today a large and growing number of adult whitetails, especially adult bucks, are no longer vulnerable to lures. Characteristically, within ten years whitetails everywhere begin to effectively counter whatever new, widely-exploited advantage human hunters dream up (including elevated stands). [We still use tree stands, along with a far greater number of ground blinds that we hunt use portable-back-packed stools.] Nonetheless, having tasted (or seen or heard of) improved hunting success as result of using a lure and/or some other technological advance in hunting gear, most whitetail hunters ardently paw through the mountain of hunting gear available today in search of some new lure or gadget that will insure quick and easy harvests of deer and eliminate the need to devote extra time and effort (before and after hunting) to whitetail hunting. In the process, today's whitetail hunters are disregarding the only two elements that can insure regular hunting success (the same two elements that enabled humans to exist on this planet until little more that a century ago) — a great knowledge of the quarry hunted and great skill in hunting. In this and future articles entitled “Back to the Basics” I will do my best to get you, whether a beginner or a salty old veteran, back on the right path. From my 27 years [45 years] of scientifically-based, hunting-related research and studies of wild (unpenned) deer (in all types of habitat except desert), untainted by human-engendered myths and misconceptions, whitetail habits and behavior and hunting instructions that will be presented evolved only from what 75–90% of whitetails did under similar circumstances 75–90% of the time. Because my research and studies are unique among outdoor writers, because whitetails are constantly adapting to whatever we do as hunters and because we must therefore adapt as well, what I write may sometimes seem strange and different to you. Rest assured, however, what I write will be as close to the truth (scientifically correct) as I can make it, and for that reason, what you learn from these articles will improve your hunting success. Before beginning, I feel it is important to put whitetail hunting in proper perspective. Whitetail hunting is a critical step in biologically-sound whitetail management, not only a means of cropping excess deer from our limited wilds, thus maintaining the health and reproductive capacity of our deer herds, but a means of cropping the less-fit of deer (deer most vulnerable to hunting by humans), thus maintaining the genetic strength of this species of wildlife (especially important today in view of the fact that there are too few wild predators in our wilds today to perform this vital task). Once a means of subsistence (living off the land), over the past one-hundred years whitetail hunting in America has become regarded as a form of “outdoor recreation,” meaning, everyone who wants to hunt whitetails can enjoy the experience of living and hunting deer in our wilds, but restrictions imposed by hunting regulations necessarily prevent all who hunt whitetails from being successful. There are simply too many whitetail hunters in America today to allow 100% hunting success. In most states there are 3–4 times more hunters than the number of excess deer that should be cropped. For this reason, no hunter should expect to harvest a deer every season, no hunter should consider it his or her right to harvest a deer every season, no hunter should be so determined to take a deer every season that he or she will stoop to unethical or illegal means to do it and no hunter should countenance wasteful hunting practices — firing at deer under iffy circumstances, risking crippling and the failure to recover a wounded deer. It should be every hunter's goal today to fire only at unsuspecting deer (standing or moving slowly) in the clear (no intervening obstructions) within easy (no-miss) shooting range. Hunters who hunt on foot, hoping to sneak up on a deer, rarely have this opportunity. Most of the deer they see are bounding headlong through heavy cover at long range. The only way unsuspecting deer can be encountered at short range with any degree of regularity is to sit in paths of moving whitetails well before they are near. This takes some doing, of course. The hunter must be knowledgeable enough to be able to predict exactly where and when one or more deer are likely to travel during a day of hunting, and skillful enough to avoid being identified by a quarry before the shot is fired. This, then, is what today's whitetail hunting is, or should be, all about.